I have a weakness for plates. Plates of all colours, shapes and sizes. My cupboard tells the story. Instead of tidy, cohesive piles of plates, there are wobbly stacks of oddly sized plates leaning at precarious angles. When my daughter empties the dishwasher, she fits the plates together in order of size on the counter top before putting them in the cupboard. When my son empties the dishwasher, it's another story. Let's just say you have to take care when opening the cupboard doors. 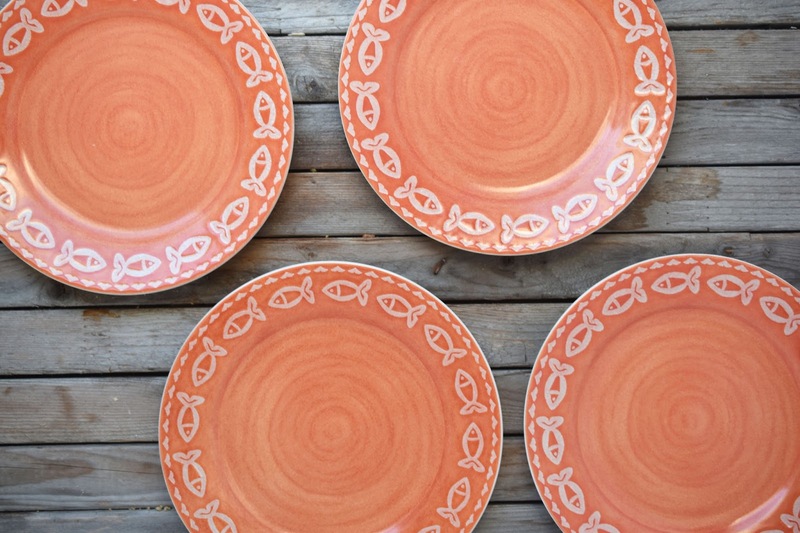 I recently spotted these peach-coloured plates with pleasant little fish around the edges at the thrift store. I don't have any plates in this colour, I rationalized. And the fish are so cute! 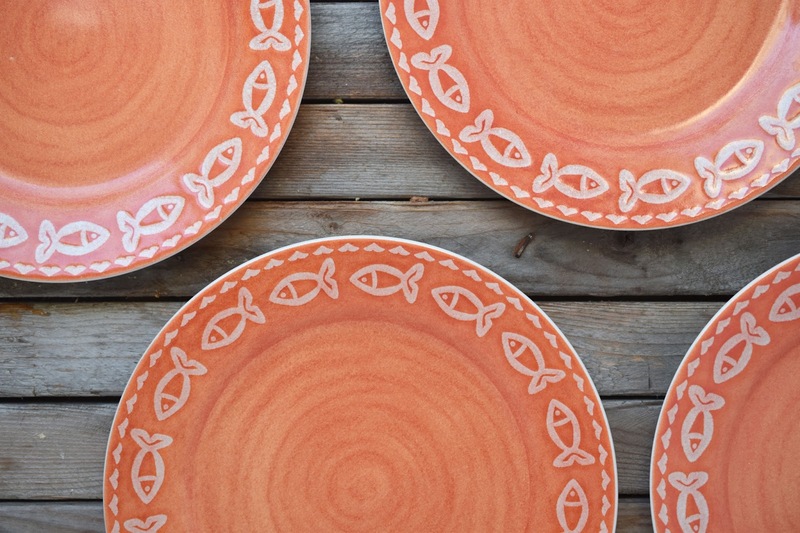 These plates will do well for my food photography props. They are small so they don't fill up the camera frame. And, because the design is on the edge, you'll still see it when there is food on the plate. These plates are Royal Norfolk, made in China, and were 99 cents each. What thrift store items do you have a weakness for? Thank you to everybody who responded to my request for feedback about these Vintage Bliss parties last week. The kids are back at school today and I'll be doing some more proper blog planning for the weeks ahead. I'll be thinking about whether and where the Vintage Bliss Tuesdays post fit into things. Hi Joann thank you for Vintage Bliss Tuesdays 97. Back to school for DGS today. Happy September. Hard to believe it's back to school time huh? Happy September to you too Joy! Joann, those plates are great! I love the color and the design. Thank you for hosting.